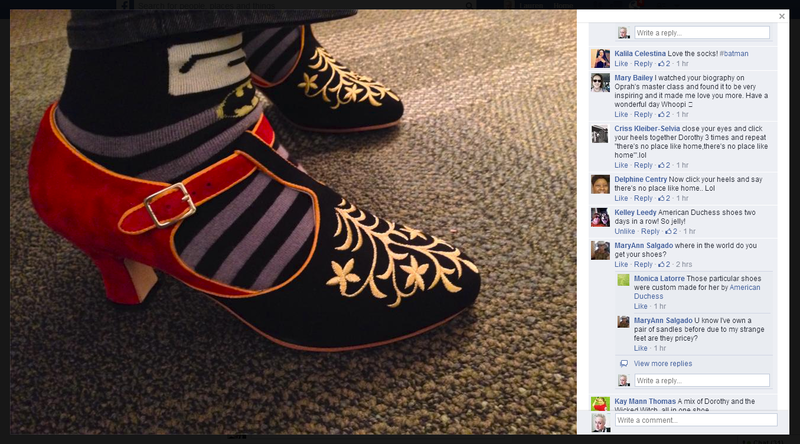 A few months ago, I was asked by Whoopi Goldberg to design some custom shoes. 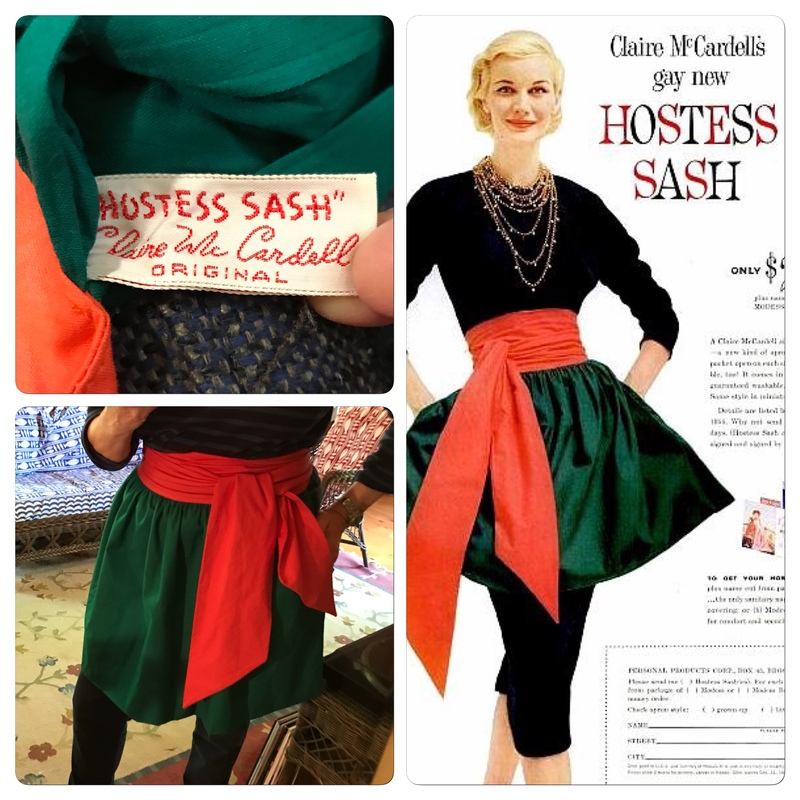 She asked me to make "four pair as rich looking and feeling as you can with your choices of fabric." So I set to work sketching out some "over the top" footwear, based on our available lasts and heels, inspired by shoes from history. Running the designs by Whoopi, she chose five and we set to work making them. 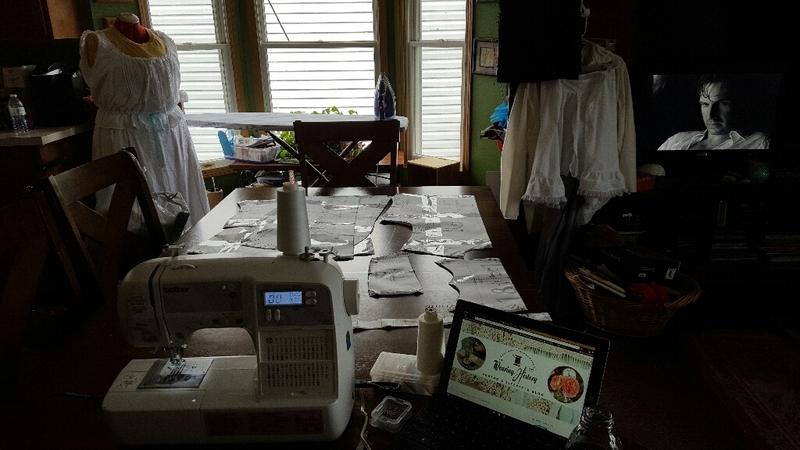 I spent quite a lot of time sourcing the right fabrics and antique trims, and a lot of back-and-forth with the workshop to get each design *just* right. 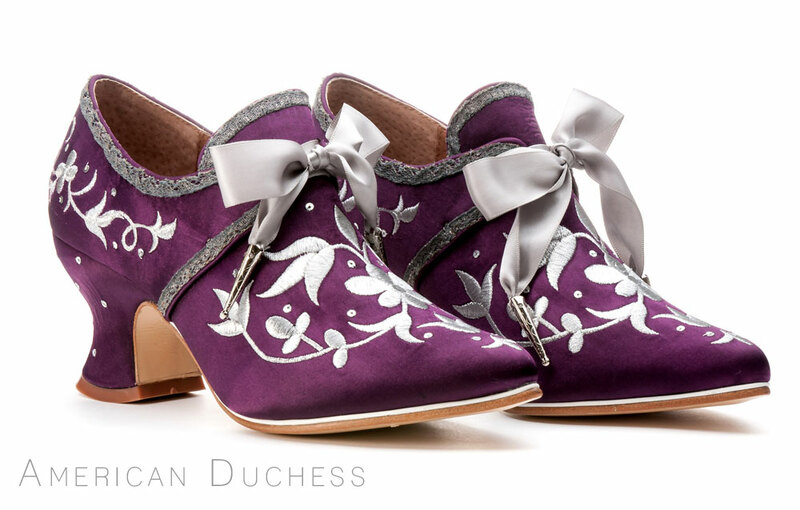 One of the designs I was most excited to try was a pair inspired by Martha Washington's 1759 wedding shoes, with influence Lady Mary Stanhope's 1660 shoes. 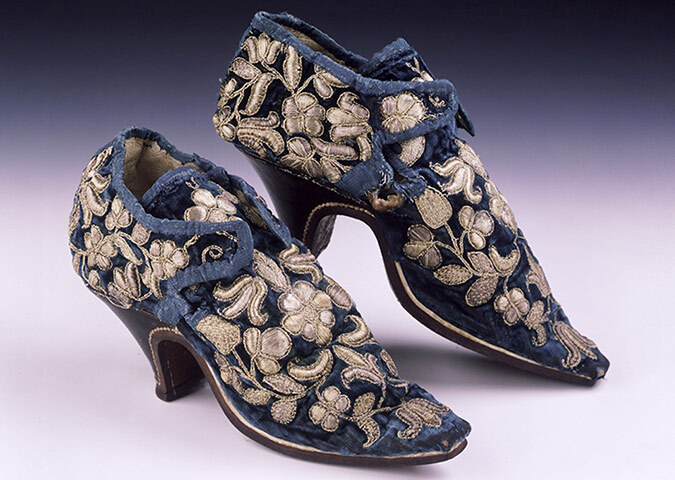 Martha Washington's shoes were made of purple silk, embroidered and spangled all over in silver. They're utterly splendid. My version is much more sedate, but I'm really pleased with how they turned out. The trim around the edges is antique French metal trim I found on Etsy. It really makes this pair totally unique, as that's not a touch that could be repeated. 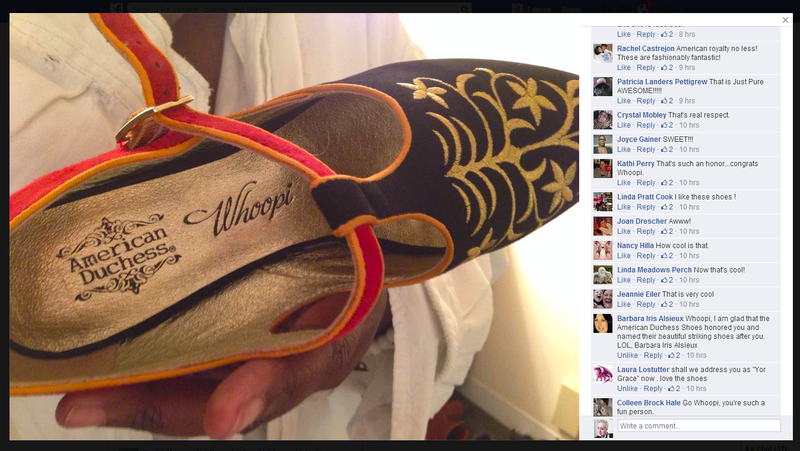 Below, Whoopi wore the "Washington" shoes on her talk show The View, and also posted a picture of them on her Facebook fan page. 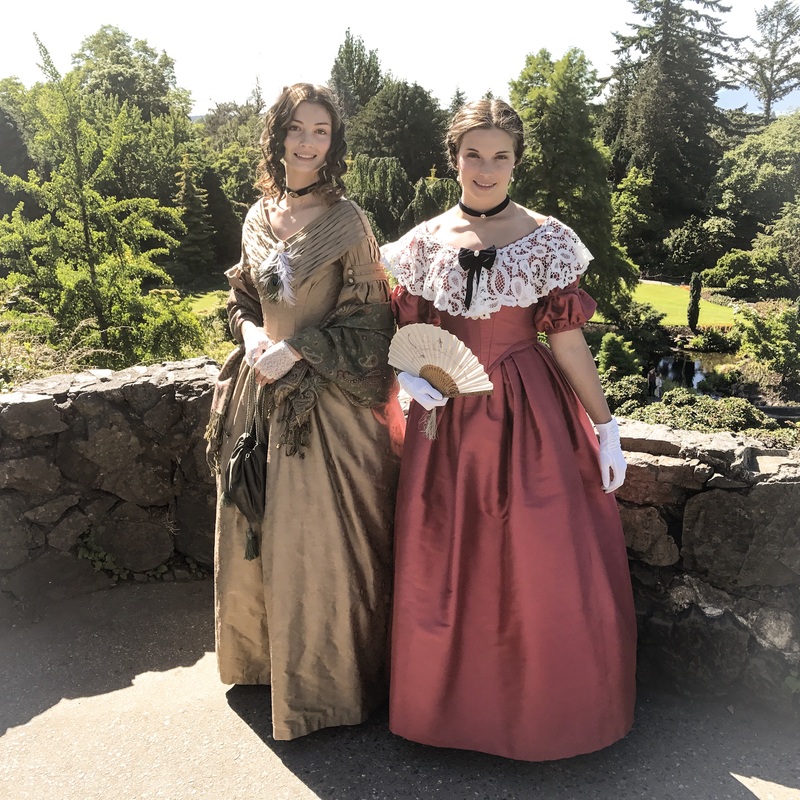 Some people loved them, some people hated them, and some even got the 18th century reference! 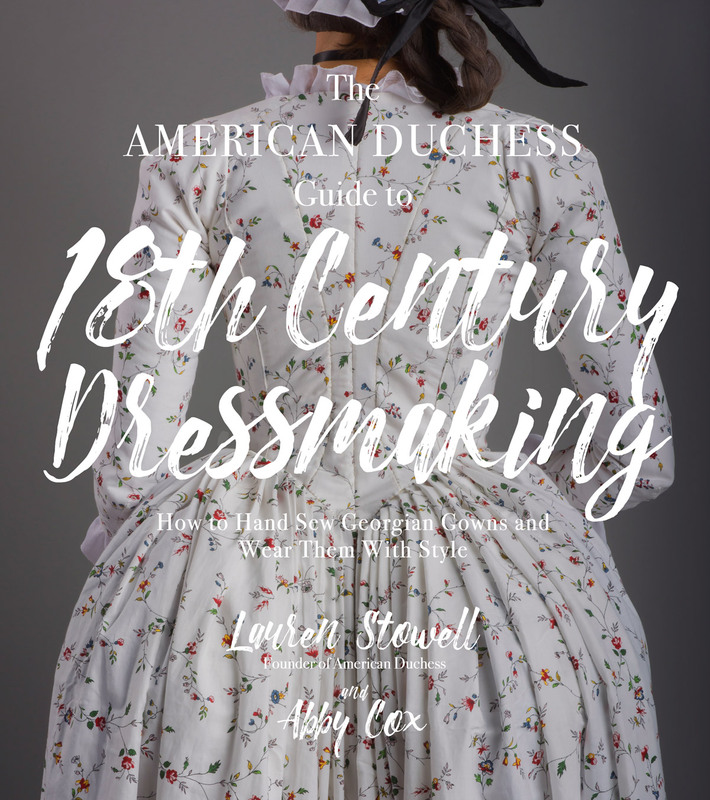 I was floored when I saw this, because it really helps to put American Duchess out there, particularly to others in the entertainment industry that may be needing some historical shoes for a movie, tv show, or stage production. 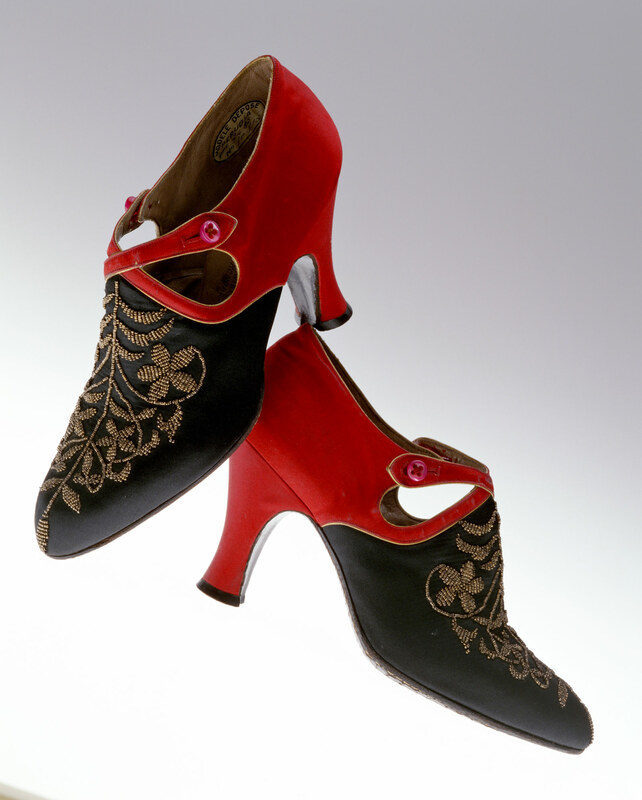 A totally different design from the 18th c. shoes, the "Chicago" t-straps were inspired by a pair of 1920s Andre Perugia pumps that had this gorgeous red and black combination, with the gold design beaded. We went for gold embroidery and did them in suede, with the buckle instead of buttons. They're really fun, and pay homage to one of the greatest shoe designers of all time. Whoopi loved these so much she wore them on The View the day after she wore the Washingtons, and was tickled that we put her name on the insole. 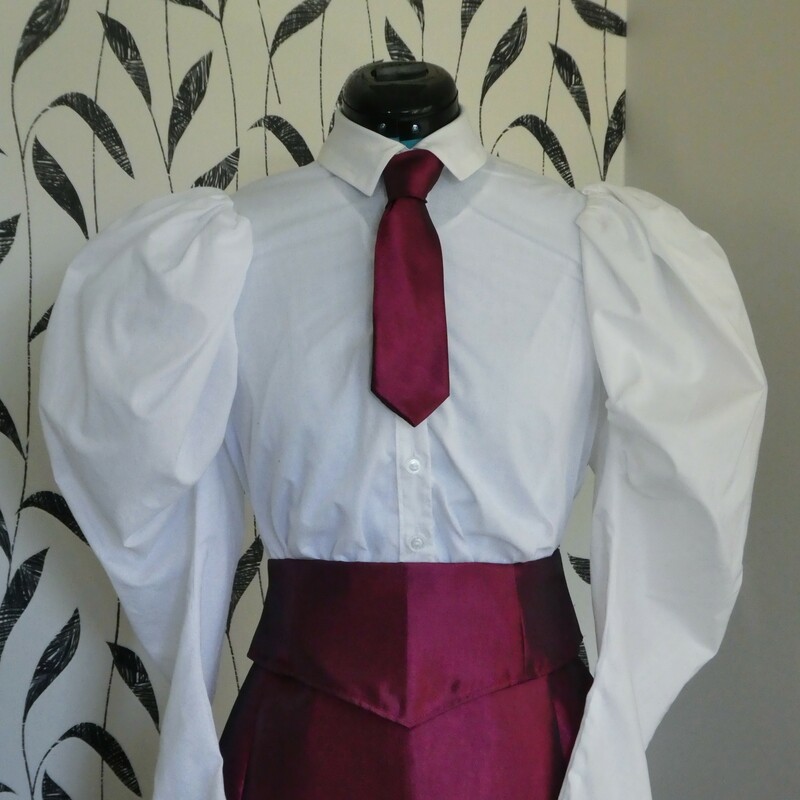 The last three were all 18th century designs again made on the Pompadour running gear. 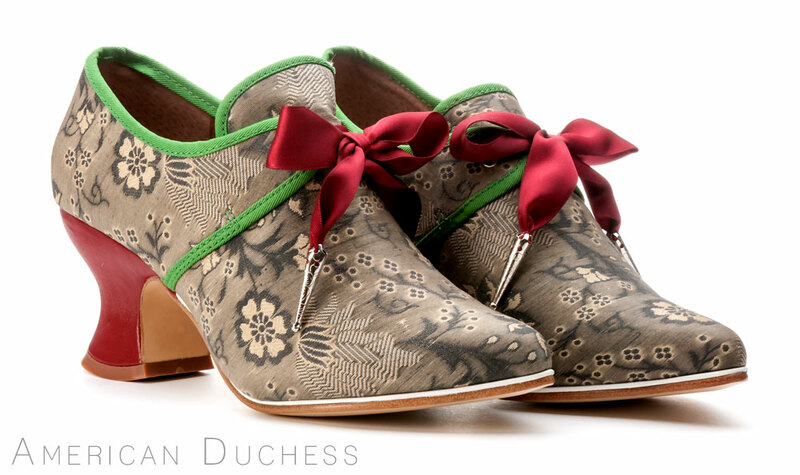 Each of the designs was inspired by original 18th century shoes, or a combination of elements from different antiques. 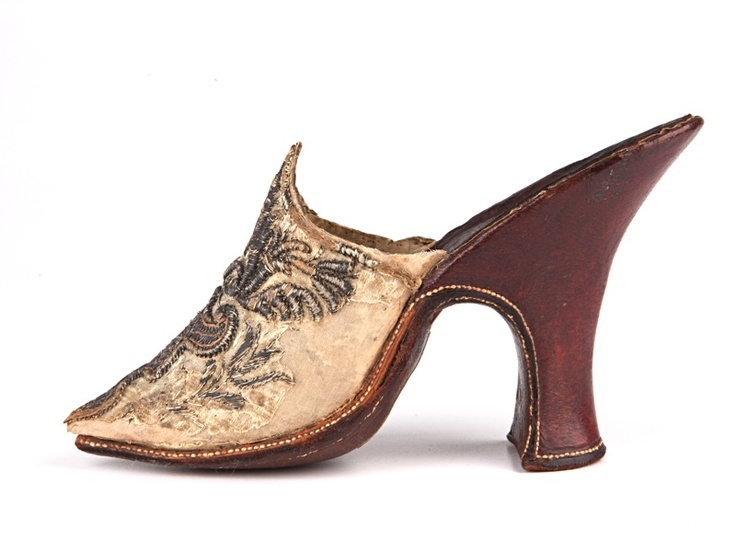 The Met, early 18th c. - one of the inspiration shoes for "Lamballe"
"Lamballe" used the iconic red leather heel, in combination with a subtle silk brocade pattern, and bright binding. These were my least favorite at first, but the compliment of red and subtle green is really growing on me. Now I think they're really quite stupendous! The "Versailles" mule again used the red heel, like the original mule from Shoe-Icons. 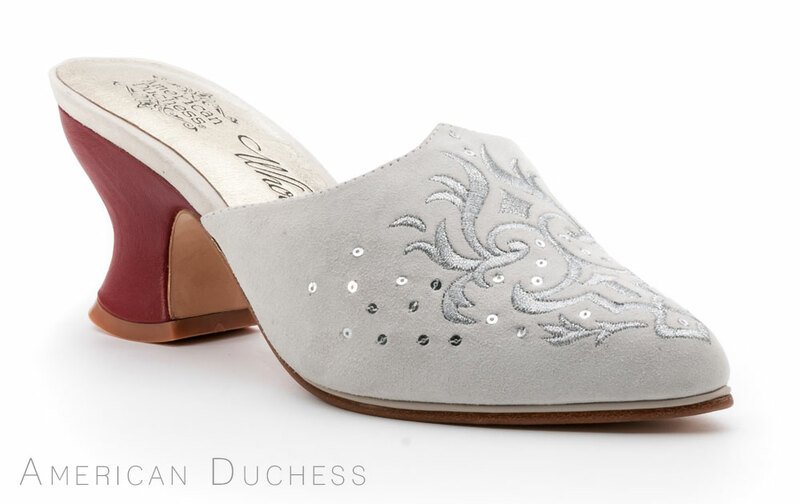 We did our version in dove grey suede, with silver embroidery and tiny spangles. I'm really proud of the work we did for Whoopi, and very glad that she was happy with them. It was a wonderful project that really just came out of the blue, but could mean some really wonderful future projects for American Duchess. 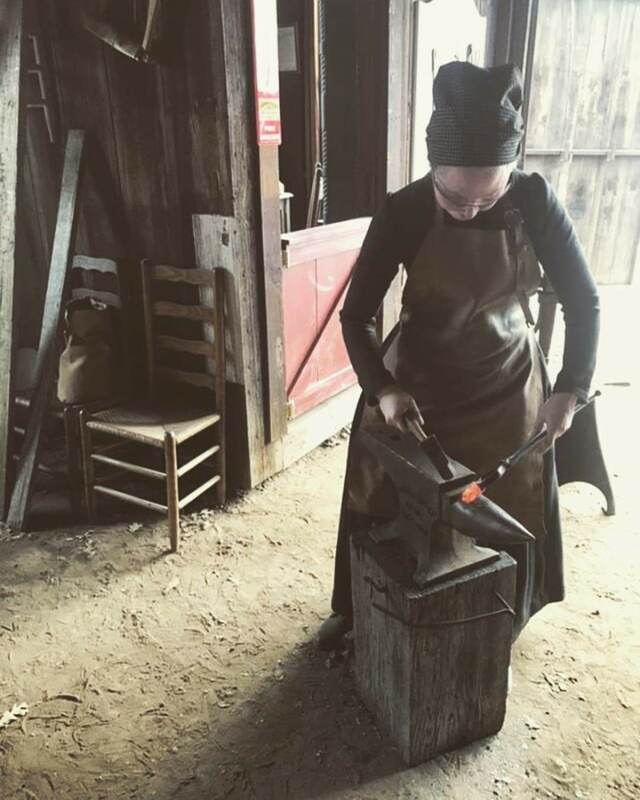 Now I know you're wondering about custom shoes, so I'm going to explain a little about this whole process. 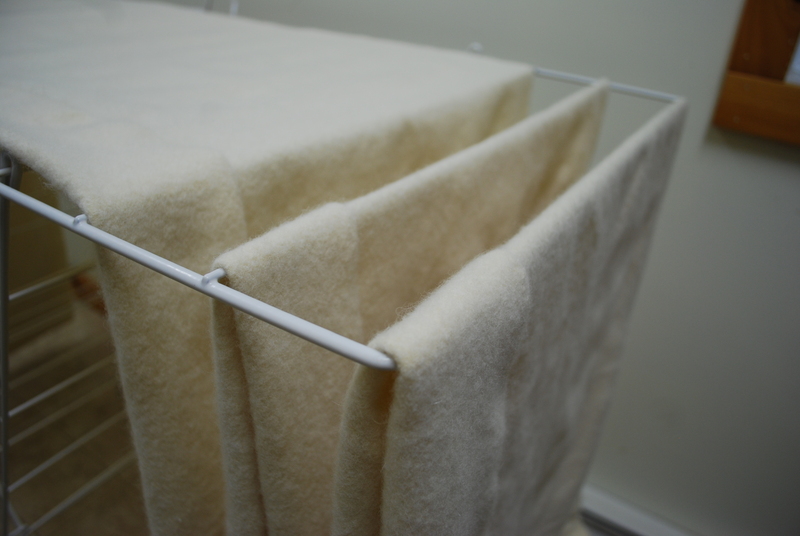 It's not something we can offer regularly (at this time), because it is immensely expensive and time consuming for both the customer and us. 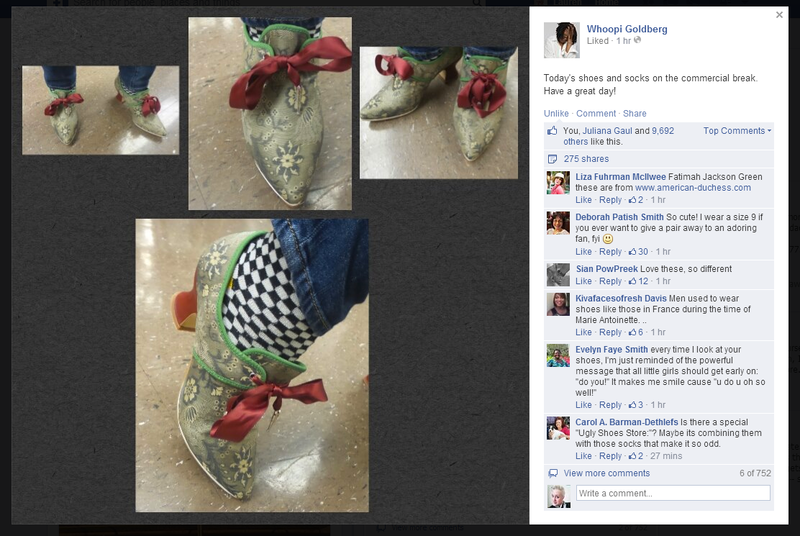 Whoopi's shoes took months to designs, work out the embroidery, source materials for, make, and ship. It was a great experiment for us, because I now know what kind of work we're capable of, and my hope is that our tiny little company profile might get a boost in the entertainment world, and we can attract more theater and film clientele. So will we make shoes like this in the future? Quite possibly! 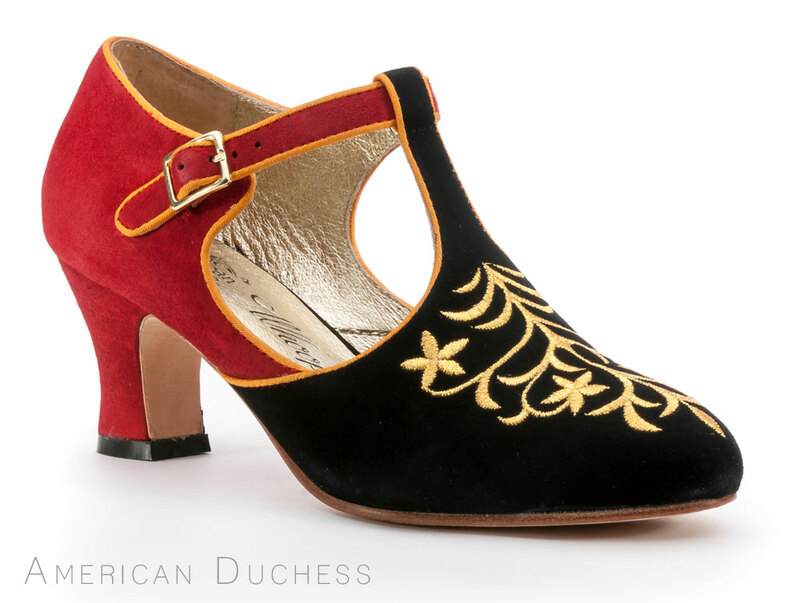 Right now we're still small and we still have to do production runs of 200, but if these wacky antique-style shoes catch on a bit, and our customer base grows to where we can sell 200 really unique shoes, then I would love to do some blingin' "signature collection" styles, you bet! I love that she wearing them with batman socks! I love your work and to see such craftmanship receive recognition is wonderful. Each are beautiful! My dream is to have a pair, hopefully soon! Welcome to the world of couture :-) even if it was just this one little taste. When clothing designers do runway shows, it isn't often about the prêt-à-porter (ready to wear), it's about showing what they are indeed capable of. So it's the couture we see, including the more fantastical stuff, walking down the catwalk. This was a fabulous way for you to show what you and your team can do on a virtual catwalk for the world to see, and it's stunning. And how cool that you got to work with Whoopi, she is an amazing lady. I'm so excited for you! I never thought of it as couture before, but your description really makes sense. It's weird to think of myself in that way. <3 I know this sounds silly but when you came out with your first shoe, I was so proud of you for accomplishing that. And then bam, the pemberley, bam, the other styles spanning decades and I have watched your business grow. I feel pride for you. And this Whoopi thing is even more amazing. You are so awesome, and such a great example of entrepreneurial spirit. Thank you! And thank you for your support all along the way. It's been quite a journey, and I hope to do some amazing things in the future! Those are absolutely to-die-for gorgeous. Beautiful work. I think we'll have to do something special like this for a "signature collection" shoe. I'm amazed by the response! I love the fabric for the Royale - I want to make a gown out of it! 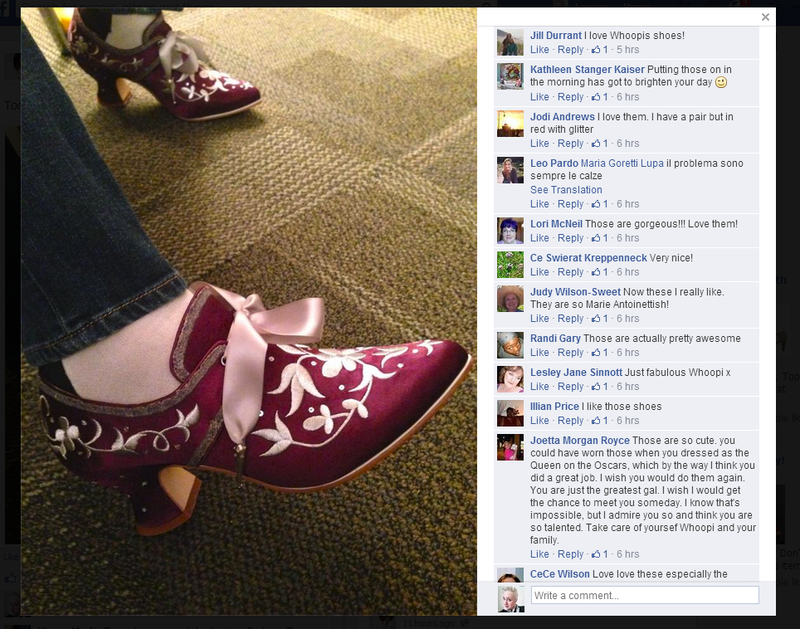 All the shoes are gorgeous, and such a cool project you got to undertake! wow they turned out so good. I love them all. 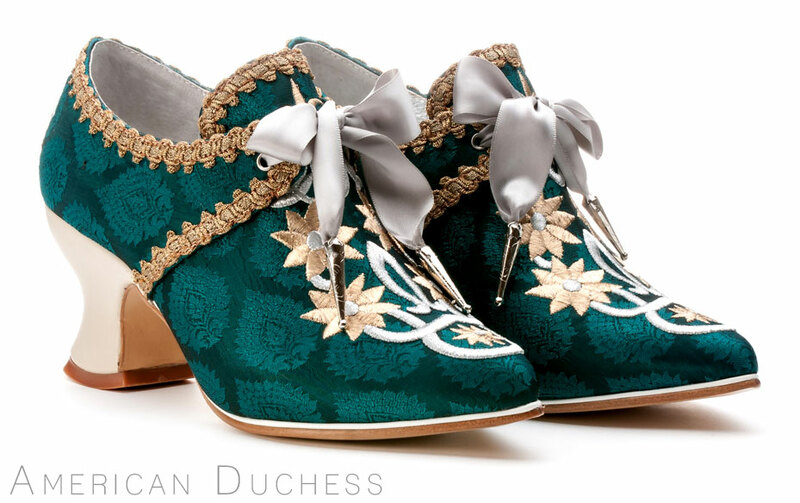 the embroidery on the shoes looks terrific . what a great thing for your business. and how cool that she wore the other pair the next day. They are so delicious, I really just want to eat them, they are so beautiful! Congratulations on such lovely work. 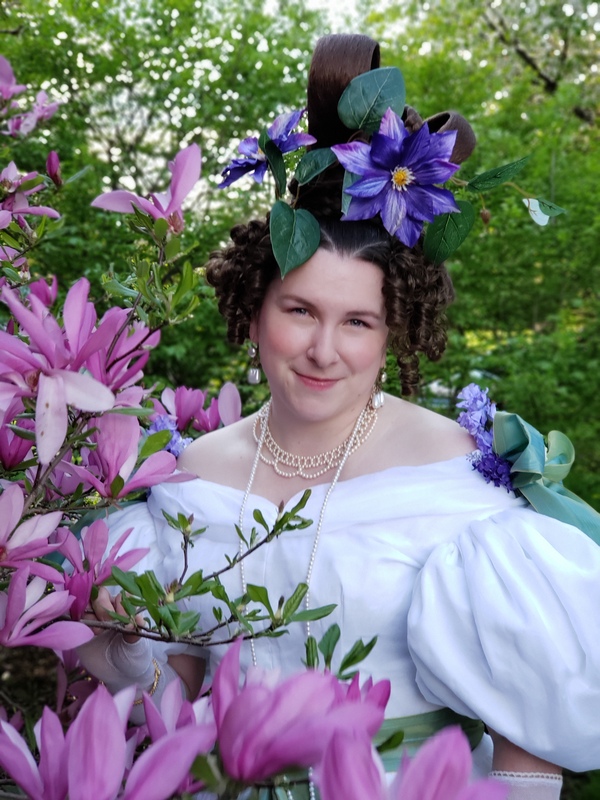 It is wonderful to see someone from the costume world get the recognition they deserve. May wonderful things come to you and your company from all this! They are such gorgeous shoes. I wish you had shop in the UK. Then I could try on the shoes and be certain they fitted. THEN I would buy a pair. My feet are just so tricky to please. 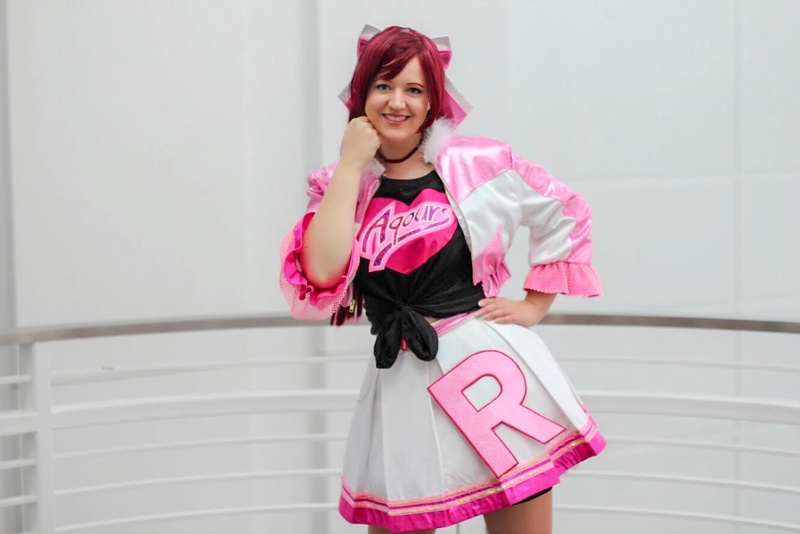 It's so lovely to see your work growing and gaining notoriety outside the costume world. I bet this will bring a whole new customer base to you! I bet you'll have no problem doing a run of a really specific style like those when people realise they are not just for costume! Can't wait to see where this goes! Fabulous! How unbelievably exciting for you!! You guys did an incredible job on her designs and I'm not at all surprised that she was in love with them. Fingers crossed for more business from Hollywood!!! I'm very happy for you! And the shoes are gorgeous! I would buy them! It would be great to be able to BUY similar shoes...!! They are all awesome, and I hope the exposure leads to bigger and better things for you! I am so happy for you! Those... are fantastic. I love unusual, quirky shoes. The historical flair just makes them all the more interesting! OH how wonderfully fun!! I think my favorites are the Martha Washington purple ones and the red and black T-strap ones....What a fun project you were able to work on!! I am sure that Miss Goldberg will be able to bring you lots and lots of business! Prepare to become very busy and sought after!! Laaaaaaaaaa!!!! Such FABULOUSNESS!!!!!! I dream of shoes such as these and aim to be a customer in the near future! 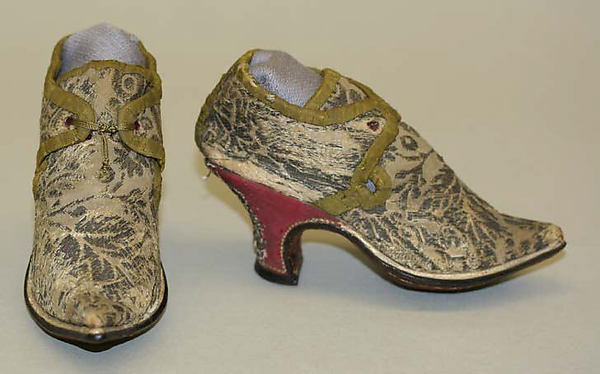 I wonder if you could do COM fabric as I have a small piece of silk LISERE that would be gorgeous on a shoe?